Today when more and more people are becoming brand conscious retailers are cashing on it and are earning big bucks. The big names in the clothing brands tell us how our fashion scenario has evolved and changed. There are some brands which have been in business for more than 100 years. These clothing brands have made a definite mark in the fashion and clothing industry. The brands have changed the whole style and clothing scenario.Media and promotions have been the sole reasons for the brand awareness and consciousness among the Generation Y.
K-Lounge is a trendsetting Fashion Retail Chain promoted by India’s premiere Fashion House – Kewal Kiran Clothing Limited. The company boasts of revolutionizing Fashion India Inc. through their 4 brands Killer, Easies, Lawman and Integriti. All these brands have attained a cult status and are exclusively available through the K-Lounge Fashion Chain.This Retail Brand of the company is replete with an extensive range of Jeans, Trousers, Shirts, T-shirts and Jackets. 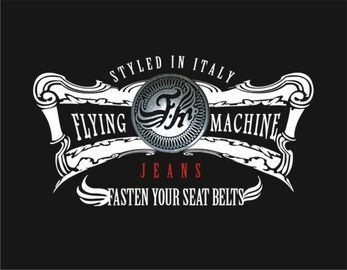 Flying Machine range of apparel reflects the future of Indian Youth fashion that believes in bringing real time international fashion to Indian audience. The brand with its contemporary styling focuses on the trends and fads of the season. The protagonist of Flying Machine Fashion Tripping Story is one such individual. With the introduction of NanoTechnology Flying Machine has come up with technological advances like Temperature regulation through hot and cold zones. Stain free jeans that cant be spoiled by coffee or wine. Zero odour jeans, Bi-strech jeans that do not de-shape even after repeated wear and undoubtedly the best skin fit jeans ever. Wrangler is a manufacturer of jeans. Its headquarters are located in downtown Greensboro, North Carolina, with production plants in a variety of locations throughout the world. Wrangler Jeans were first made by Blue Bell, who acquired the brand when they took over Casey Jones in the mid-1940s. Blue Bell employed Bernard Lichtenstein (‘Rodeo Ben’), a Polish tailor from Łódź who worked closely with cowboys, to help design jeans suitable for rodeo use. This was the origin of Wrangler Jeans. The 13MWZ style, introduced in 1947, is still available worldwide. In addition to this, Wrangler has since introduced several other lines that are more designated towards a specific group or demographic. Some examples of this are 20X, Riggs and Aura. The Spykar story started way back in 1992, when Mr. Prasad Pabrekar led by ambition ventured into fashion apparels and accessories to make use of his vast repertoire of technical knowledge in processing of denim garments. He started the company with the firm belief that the best investment for the Company was Human Capital, starting with a just a handful, and slowly built up a company with over 300 associates.Spykar has always strived to produce a product, having a global appeal. Denims are the core of the company’s business. This has been facilitated by the company’s in-house processing unit and gives the company the competitive edge in consistently producing denims of international quality. To continuously innovate, and to bring new styles, cuts and fabric to the market, the company has a team of young and dedicated designers and merchandisers, who are extremely aware of the latest trends in the international market.Since Spykar designs specifically for Indian audiences, it has the best fits and designs in its repertoire. The Company was founded by Renzo Rosso and his former boss Adriano Goldschmied of the AG Jeans Company, in 1978. Diesel’s milestone years include 1985 (Renzo’s complete acquisition of the company), 1988 the hiring straight out of fashion college of current head designer and Creative Director Wilbert Das, 1991 (beginning of the international marketing strategy) and 1996 (opening of Diesel’s first flagship store on New York City’s Lexington Avenue). In February 2007, the company launched a major intimates and beachwear division for men and women that is carried in the retail and department stores. Diesel Black Gold was announced in November 2007.Revenue is largely derived from denim sales, but also extremely successful and influential ranges of accessories and children’s wear – Diesel Kid. True Religion Brand Jeans is known not only for its denim, but also for its knit and woven sportswear, such as t-shirts, western shirts, sweatshirts and sweatpants that all have that vintage feel. True Religion’s commitment to perfect fit, timeless style and that hippie bohemian chic flair have solidified True Religion’s brand position as a leader in premium denim and casual sportswear globally. The company was formed in 1889 by Henry David Lee as the Lee Mercantile Company at Salina, Kansas producing dungarees and jackets. The growth of Lee was prompted by the introduction of the Union-All work jumpsuit in 1913 and their first overall in 1920. Later in the 1920s Lee introduced a zipper fly and continued to expand. Around this time, the first children’s overall line was sold. In 1928 H.D. Lee, founder and president of The H.D. Lee Mercantile Company, died of complications following a heart attack. During the 1930s and 1940s the company became the leading manufacturer of work clothes in the US. In 1944, the Lazy “S” became the official Lee back pocket. A flood wiped out Lee’s Kansas City distribution center. It ruined the entire stock of merchandise, except the Buddy Lee dolls, which floated. In 1954, Lee expanded into casual wear. During the 1960s the company expanded to 81 countries and in 1969 was acquired by VF Corporation, becoming a brand. Denim made the crossover into the fashion market and bell bottoms are welcomed with open arms by Vietnam protesters. Lee aired its first television advertisement, which promoted Lee western wear. In the 1970s Lee shifted its focus from the workwear business and began catering to fashion cycles. Lee is one of the best Indian Denim Brands for men in India as is highly popular amongst the youth. Numero Uno, one of the India’s first indigenously manufactured dennim lables, was incorporated in 1987 by HI Fashion Clothing Co. The flagship brand of Numero Uno Clothing Ltd., Numero Uno has over the years metamorphosised into a dynamic and responsive brand for the youth. Today, it has the priviledge of being one of the few power brands that fuses international trends, innovative fabric, washes, treatments and accessible pricing. Numero Uno started by primarily manufacturing jeans for men and slowly moved into jeans for women, eventually designing and manufacturing complete wardrobes for men and women. The company has been introducing trendy and innovative themes every season to cater to changing tastes and lifestyles.